Origin Access Premier Membership Now Available! Origin Access’ premium membership called Origin Access Premier is now available for everyone with an Origin account! Premier Membership gives you even more games to play for a monthly ($14.99) or annual ($99.99) payment. With Premier you’re able to have a full access to EA’s latest games as well as receive early (and full) access to EA’s upcoming games such as FIFA 19, Anthem and so on. Compared to the Basic Membership which is $3.99 a month you also get a full access to Expansion Packs, DLCs and other content available for select games. 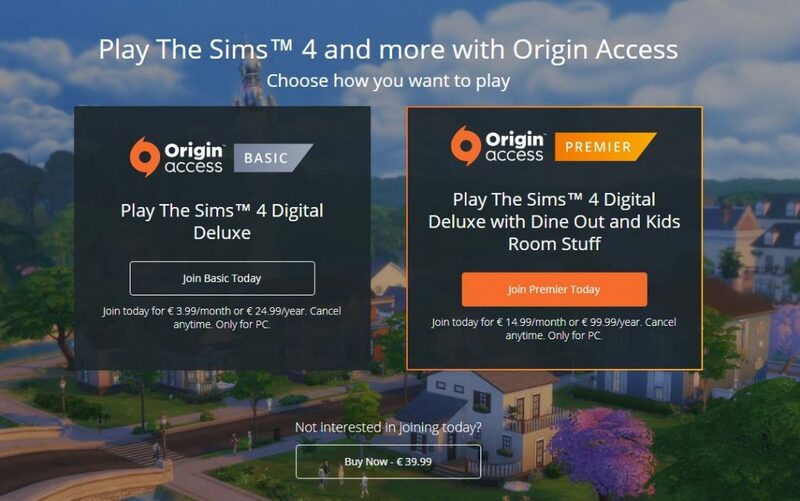 For The Sims 4 you get an access to a special The Sims 4 Bundle which includes The Sims 4 Base Game, The Sims 4 Dine Out Game Pack and The Sims 4 Kids Room Stuff Pack. This is really great for us all.